If you’re living in the UK or elsewhere in Europe, then you’ve already heard about the scary new disease of ash trees, known here as Ash dieback or in France as “Chalarose.” Like many tree diseases that have devastated forests, this one is caused by a fungus, Hymenoscyphus pseudoalbidus (anamorph: Chalara fraxinea ). According to the Forestry Commission, the fungus was introduced in February 2012 by import of infected trees from a nursery in the Netherlands to one in Buckinghamshire. It has already caused serious problems in Poland (where 3,000 infected trees fell on one windy night), Denmark (killing 95% of their trees), Lithuania (resulting in mortality of 60% of all ash stands), Austria, Belgium, the Czech Republic, Finland, France, Germany, Hungary, Italy, the Netherlands, Norway, Slovenia and Sweden, and is now wreaking havoc across the UK (Map of confirmed infections). This is very bad news indeed for our woodlands, as ash trees make up over 10% of the trees we have. 1) Where did it come from? As with many emerging diseases, the answer to this is not clear. The pathogen is closely related to another non-pathogenic fungus, Hymenoscyphus albidus, which has been widespread in Europe since the mid 19th century. (Interestingly, it seems as though the spread of the pathogenic species has lead to local extinctions of the native fungus in parts of Denmark .) The fungus was first described in 2006, but seems to have been around since the early 90s, when it devastated forests in Poland. Whether the species is a mutant of the closely related, yet harmless, H. albidus remains to be seen. As we are now in the genome era, the most informative way of determining how this new species came to be is to take a comparative genomic approach. For many pathogens, comparing their whole genome to those of closely related, but non-pathogenic species has allowed researchers both to infer the phylogeny of the pathogen and to identify regions of the genome that are likely to be involved in making it harmful to its host. This approach has been successfully used to identify candidate genes associated with virulence in a number of Pseudomonas syringae bacterialpathogens  and to demonstrate the movement of genes from pathogens to free-living bacteria. Comparative genomics can also help elucidate whether the pathogen is truly newly emerged (which you could conclude if there was very little genetic variation among the isolates collected from different parts of the species range) or whether it has been around for a while. Surprisingly, there is evidence from molecular characterization of strains from Finland, Estonia and Latvia that there is quite a bit of variation already, suggesting that this fungal species has either been around for quite some time already or has evolved multiple times from a closely related species . For now, we will have to wait and see what story the H. pseudoalbidus genome has to tell us. 2) How is it transmitted? The latest headlines from BBC and the Guardian state that the number of sightings has doubled in the last month, with about 300 confirmed cases in the UK. (Of course, what they don’t emphasize is that the awareness of the disease has increased exponentially since the news broke that the first case had been found back in early November.) So how is it moving around? And how is it infecting new trees once it arrives? It seems that the sexual stage is wind dispersed, with a suggested dispersal distance of 20 to 30 km per year. The best way to determine how a disease is transmitted is by having lots of data over multiple years and then building a series of models that predict how the spread would look under varying assumptions – e.g. if it is limited by the dispersal rate of a vector, such as an insect, or the wind – and then testing which model fit the actual spread the best. Given the speed at which this pathogen has spread across Europe, it seems that wind dispersal is the most likely explanation for spread within forests and that human transport of saplings from country to country is the most likely explanation for new epidemics. It’s unclear exactly how the pathogen infects new trees once it gets to a new place, but there is some evidence it is through the leaves (this is true of many plant pathogens). 3) Why is it becoming a problem now? Again, the short answer is that we don’t know. The longer answer is that it may be related to our colder, damper summers over the past few years or it may be related to tree stress. 5) Is there any natural variation in susceptibility? The good news is that there is some burgeoning evidence for genetic resistance to the disease, as not all trees die of infection. A study of trees in Denmark found that individuals with early leaf senescence (i.e., those that lost their leaves early in the season) were less susceptible than late-senescing individuals . Interestingly, early leaf loss is also a symptom of the disease. Unfortunately, it looks like only a very small proportion of trees are resistant ; most likely too few to prevent a severe population crash. However, the presence of resistance at all suggests that evolution can work its magic. That being said, natural selection can be a painfully slow process, especially for such a long-lived organism. Therefore, a little bit of artificial selection (where individuals that are known to be resistant are crossed and their offspring are planted) could be a good solution to slowing the spread of the disease and eventual eradication. Finally, let’s not forget that it’s not just the ash trees that are under threat! These trees are host to about 30% of all UK lichens, many of which are currently considered endangered species, and any number of bacterial species . Also, there are at least two moth species that specialize on ash: the Dusky thorn (Ennomos fuscantaria) the centre-barred sallow (Atethmia centrago). This disease therefore has the potential to be a real threat of local ecosystems if left unchecked. 1) If, like me, you have no idea what an anamorph is, it turns out the species was described twice in two different stages of its life cycle: the sexual stage – the teleomorph, and the asexual stage – the anamorph. The former is usually a fruiting body while the latter is more mold-like, which explains why they might have been considered different species. 2) McKinney, L., Thomsen, I., Kjær, E., Bengtsson, S., & Nielsen, L. (2012). Rapid invasion by an aggressive pathogenic fungus (Hymenoscyphus pseudoalbidus) replaces a native decomposer (Hymenoscyphus albidus): a case of local cryptic extinction? Fungal Ecology, 5 (6), 663-669 DOI: 10.1016/j.funeco.2012.05.004. 3) Baltrus, David A., et al. “Dynamic evolution of pathogenicity revealed by sequencing and comparative genomics of 19 Pseudomonas syringae isolates.” PLoS pathogens 7.7 (2011): e1002132. 4) Ma, Li-Jun, et al. “Comparative genomics reveals mobile pathogenicity chromosomes in Fusarium.” Nature 464.7287 (2010): 367-373. 5) Rytkonen, A., Lilja, A., Drenkan, R., Gaitner, T., and Hantula, J. 2010. First record of Chalara fraxinea in Finland and genetic variation among isolates sampled from Åland, mainland Finland, Estonia, and Latvia. For. Path. 6) McKinney, Lea Vig, et al. 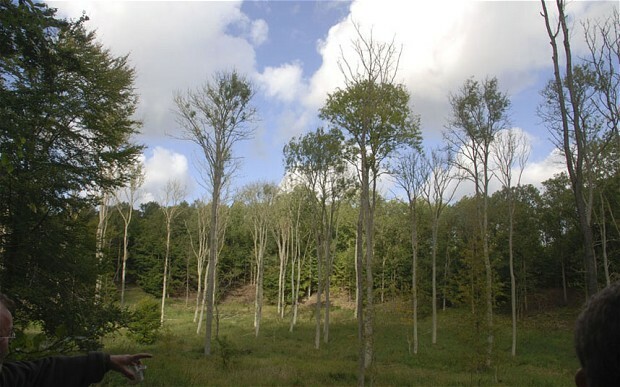 “Genetic resistance to Hymenoscyphus pseudoalbidus limits fungal growth and symptom occurrence in Fraxinus excelsior.” Forest Pathology 42.1 (2011): 69-74. 7) McKinney, Lea Vig, et al. “Presence of natural genetic resistance in Fraxinus excelsior (Oleraceae) to Chalara fraxinea (Ascomycota): an emerging infectious disease.” Heredity 106.5 (2010): 788-797. 8) Ellis, Christopher J., Brian J. Coppins, and Peter M. Hollingsworth. “Tree fungus: Lichens under threat from ash dieback.” Nature 491.7426 (2012): 672-672. “The evolution of host defenses against parasites and pathogens has resulted in a wide array of mechanisms conferring resistance and tolerance. Many of these adaptations have been co-opted for use in the treatment of disease, for example the use of live vaccines to prime the host immune system through the memory of B and T cells or the creation of transgenic crop plants to increase resistance to pests and pathogens (e.g., Schoonbeek et al. 2015; Tripathi et al. 2015). Indeed, the acquisition of basic knowledge regarding host–pathogen coevolution has underpinned much of the advancement in applied sciences of healthcare and disease management. Few such examples, however, have generated the widespread excitement and rapid development as the CRISPR/Cas system discovered in bacterial and archaeal genomes. When bacteria coevolve with their bacteriophage viruses, they typically face strong selection to recognize and resist infection by circulating phage genotypes. Among the many mechanisms that have evolved in response to this pressure is the CRISPR/Cas system, which provides adaptive immunity to its host against specific phages. The system is built from clustered regularly interspaced short palindromic repeats (CRISPRs) within the genome that act together with CRISPR-associated (Cas) proteins to target and destroy foreign nucleic acids, including those from viruses and plasmids (reviewed in Barrangou 2015). In the laboratory, experimental coevolution between bacteria and phages has been used to uncover the exact mechanisms of resistance and counter-adaptation as well as to determine the potential ecological and evolutionary impacts of such coevolution in shaping microbial populations and communities. Recent work by David Paez-Espino and coauthors has clearly demonstrated that phage populations respond rapidly to CRISPR-mediated immunity both through the accumulation of single nucleotide polymorphisms within the region of the phage genome targeted by CRISPR and via rampant recombination among phage types. Using long-term experimental coevolution of Streptococcus thermophiles and phage 2972, they were able to track specific evolutionary responses of the phage populations through deep sequencing and show that mutation rates were much higher than those of corresponding host populations (Paez-Espino et al. 2015). Such a rapid response by phages suggests bacterial host populations will be under a constant selection pressure to renew resistance, and emphasizes the power of the CRISPR/Cas system to confer such evolutionary flexibility. In natural populations, bacteria–phage coevolution has also been shown to occur rapidly under CRISPR-mediated selection. Laura Sanguino and collaborators have elegantly demonstrated that CRISPR sequences obtained through metagenomics can be used to build bioinformatics networks that link viruses with their coevolving hosts (Sanguino et al. 2015). Using Arctic glacier ice and soil samples, the authors compared the direct repeats of microbial origin and short sequence spacers of viral origin that make up the CRISPR region to uncover the interaction dynamics of hosts and their, often broad host range, viruses. They found more abundant CRISPRs in ice samples relative to soil, possibly indicating higher viral diversity and infectivity rates (although they note this may also be due to limited depth of coverage in the soil metagenome dataset), and evidence for phage-mediated transduction in the bacterial community. Now, this mechanism of prokaryotic immunity is being successfully developed as a genome-editing tool, including the engineering of mammalian cells. The CRISPR/Cas system holds the potential to knockout specific regions of the genome, alter multiple loci simultaneously, and selectively manipulate gene expression over time. This newly emerging tool not only promises to revolutionize the field of genetics, but also has direct application to the treatment of disease (reviewed in Pellagatti et al. 2015). For example, the Cas9-based DNA editing system is being exploited to help combat viral diseases through the identification of human genes linked to viral replication and the direct targeting of DNA viruses within the human body (reviewed in Kennedy & Cullen 2015). Work by Hsin-Kai Liao and colleagues recently demonstrated how the CRISPR/Cas9 system can be adapted to human cells in order to mount intracellular defense against HIV-1 infection (Liao et al. 2015). Their work shows that engineered cells expressing HIV-targeted CRISPR/Cas9 can be used both to disrupt viral DNA integrated into the host genome and to prevent new viral infection, emphasizing the great therapeutic potential of the system. Barrangou, R. 2015. The roles of CRISPR–Cas systems in adaptive immunity and beyond. Current Opinion in Immunology 32:36–41. Belhaj, K., A. Chaparro-Garcia, S. Kamoun, N. J. Patron, and V. Nekrasov 2015. Editing plant genomes with CRISPR/Cas9. Current Opinion in Biotechnology 32:76–84. Chen, S., N. E. Sanjana, K. Zheng, O. Shalem, K. Lee, X. Shi, D. A. Scott, J. Song, J. Q. Pan, R. Weissleder, H. Lee, F. Zhang, and P. A. Sharp 2015. Genome-wide CRISPR screen in a mouse model of tumor growth and metastasis. Cell 160:1246–1260. Kaiser, J., and D. Normile 2015. Embryo engineering study splits scientific community. Science 348:486–487. Kanchiswamy, C. N., M. Malnoy, R. Velasco, J. S. Kim, and R. Viola 2015. Non-GMO genetically edited crop plants. Trends in Biotechnology. doi:10.1016/j.tibtech.2015.04.002 [In press]. Kennedy, E. M., and B. R. Cullen 2015. Bacterial CRISPR/Cas DNA endonucleases: a revolutionary technology that could dramatically impact viral research and treatment. Virology 479:213–220. Liao, H. K., Y. Gu, A. Diaz, J. Marlett, Y. Takahashi, M. Li, K. Suzuki, R. Xu, T. Hishida, C.-J. Chang, C. Rodriguez Esteban, J. Young, and J. C. I. Belmonte. 2015. Use of the CRISPR/Cas9 system as an intracellular defense against HIV-1 infection in human cells. Nature Communications 6:6413. Paez-Espino, D., I. Sharon, W. Morovic, B. Stahl, B. C. Thomas, R. Barrangou, and J. F. Banfield. 2015. CRISPR immunity drives rapid phage genome evolution in Streptococcus thermophilus. mBio 6:e00262-15. Pellagatti, A., H. Dolatshad, S. Valletta, and J. Boultwood. 2015. Application of CRISPR/Cas9 genome editing to the study and treatment of disease. Archives of Toxicology doi: 10.1007/s00204-015-1504-y [Epub ahead of print]. Sanguino, L., L. Franqueville, T. M. Vogel, and C. Larose. 2015. Linking environmental prokaryotic viruses and their host through CRISPRs. FEMS Microbiology Ecology 91:fiv046. Schoonbeek, H. J., H. H. Wang, F. L. Stefanato, M. Craze, S. Bowden, E. Wallington, C. Zipfel, and C. J. Ridout 2015. Arabidopsis EF-Tu receptor enhances bacterial disease resistance in transgenic wheat. New Phytologist 206:606–613. Tabashnik, B. E., Y. Carrière, M. Soberón, A. Gao, and A. Bravo. 2015. Successes and failures of transgenic Bt crops: global patterns of field-evolved resistance. Bt resistance: characterization and strategies for GM crops producing Bacillus thuringiensis toxins: 1–4. Tripathi, L., A. Babirye, H. Roderick, J. N. Tripathi, C. Changa, P. E. Urwin, W. K. Tushemereirwe, D. Coyne, and H. J. Atkinson. 2015. Field resistance of transgenic plantain to nematodes has potential for future African food security. Scientific Reports 5:8127. “The recent epidemic of the Ebola virus is a particularly horrific example of the consequences of disease transmission between species. Spillover infection from populations of one species, in which a pathogen may be endemic, coevolved, and often less harmful, into populations of a novel host species has the potential to lead to epidemics of particularly virulent pests and pathogens. Understanding the probability of such spillover and the evolutionary, as well as coevolutionary, processes that occur after a cross-species transmission event occurs is key to predicting disease emergence and spread. This is especially important in the case of transmission between natural populations and managed ones, where disease emergence may have significant societal impact. A classic example is the spillover of canine distemper virus from domestic dog populations into wild lion populations in the Serengeti, which has lead to a series of disease outbreaks and subsequent population declines. Using data collected across three decades, Viana et al. (2015) recently compared the disease dynamics of dog and lion populations to determine whether and how the two were linked. Their model suggests that although spillover from dog populations was the likely driver of disease in lion populations initially, the peak infection periods for each of the two species became increasingly asynchronous over time, suggesting a role for other reservoir species and/or evolution of the circulating viral strains. This work is an elegant example of the value of long term data sets, especially with the development and application of new statistical and modeling techniques, for examining the changing disease dynamics over time. One powerful tool for uncovering patterns of spillover is the use of social and contact networks to study transmission, as recently reviewed by Craft (2015). Understanding transmission likelihood is a key first step in determining the selection acting on pathogen populations and the potential for host shifts and the piece outlines current methods for using information about contact within populations, for example as resulting from movement, sociality, or behavior, to help inform questions of disease transmission across livestock and interacting wildlife. Craft distinguishes the utility of social network analysis, in which contact structure within and/or among populations is described, and network modeling, a tool with which to simulate disease spread across a contact network, for predicting the risk and consequences of disease spread. She also discusses how human intervention of spatial structure and group size can alter the likelihood of transmission, both within and among populations, and therefore how spillover involving managed populations may differ from that among wild populations. Another topical example of spillover from managed into natural populations is the case of wild pollinator exposure to viruses from commercial pollinators. A recent review by Manley et al. (2015) demonstrates the potential threat for movement of RNA viruses into wild pollinators from managed honeybee populations. As many of these viruses are known to be rapidly evolving, such spillover events can lead to pathogen adaptation to novel hosts and eventual host shifts. By collating evidence for viral spillover events among populations, the authors demonstrate the potential importance of cross-species transmission in shaping disease emergence, especially when there are shared ranges, niches or behaviors between managed and wild species. Work by McMahon et al. (2015) used data from a large-scale survey of co-occurring managed honeybee and wild bumblebee populations to explore correlations in prevalence and viral loads between the two, as might be expected if cross-species transmission was common. Although they found a significant association between prevalence of viruses in honeybees and bumblebees, they also report large species-specific differences in prevalence and load across the viruses examined, suggesting more data is needed to determine the direction of transmission. Craft, M. E. 2015. Infectious disease transmission and contact networks in wildlife and livestock. Philosophical Transactions of the Royal Society of London B: Biological Sciences 370:1669. González, E., A. Salvo, and G. Valladares. 2015. Sharing enemies: evidence of forest contribution to natural enemy communities in crops, at different spatial scales. Insect Conservation and Diversity (online early) DOI: 10.1111/icad.12117. Manley, R., M. Boots, and L. Wilfert. 2015. Emerging viral disease risk to pollinating insects: ecological, evolutionary and anthropogenic factors. Journal of Applied Ecology 52:331–340. McMahon, D. P., M. A. Fürst, J. Caspar, P. Theodorou, M. J. F. Brown, and R. J. Paxton. 2015. A sting in the spit: widespread cross-infection of multiple RNA viruses across wild and managed bees. Journal of Animal Ecology 84:615–624. Viana, M., S. Cleaveland, J. Matthiopoulos, J. Halliday, C. Packer, M. E. Craft, K. Hampson et al. 2015. Dynamics of a morbillivirus at the domestic–wildlife interface: canine distemper virus in domestic dogs and lions. Proceedings of the National Academy of Sciences, USA 112:1464–1469. I love blogging, and twitter, and emailing, and even the occasional Facebook check. I’ve always accepted that much of my life is open to the public, and I think hard before I tweet or post about anything too personal. I try to keep my public-facing persona professional and science-focused most of the time (with the occasional whinge about work-life balance or expression of delight regarding the rare Cornish sun) and actually even enjoy managing my online profile*. That is why this particular dilemma has caught me off guard. I recently (i.e. six weeks ago) had a baby. A perfect, all-consuming bundle of delight. This did not come as a surprise. In fact, I had over nine months to prepare for this particular wrench in the works. I submitted all of the manuscripts I’d been working on – except one; sorry coauthors! – and finished painting rooms in the house and putting up wallpaper. I tried to get ahead as much as I could, preparing for this great conference I am co-organizing on emerging plant pests and pathogens (see you there? ), wrapping up experiments, and helping my group so they could get along without me for a few weeks**. I felt more than ready when she came along 12 days late. The one thing I hadn’t prepared myself for was the decision regarding whether or not I was going to make her presence part of my public-facing persona. Suddenly even Facebook, which I restrict to only friends and family, felt too public to reveal anything about this new aspect of my life. I really enjoy online discussion of women in science issues and the difficulties in balancing work and family life, but suddenly felt uncomfortable with the idea that the discussion would be specifically about me and my experiences. Now that I’ve had a few weeks to equilibrate and think about how to move forward (and now that I am getting much much better at typing with one hand) I’ve decided it’s time to begin sharing. I still will not add an auto-reply to my email and I will probably not post pictures of the F1 any time soon, if at all. But I am finally ready, and indeed excited, to become part of the #maternityleavescience crew. So far I am happy to say that my productivity has dropped – but not perished. The work I am able to do, I am finding that I can do with more focus and even with renewed insight (baby brain, schmaybe brain). I am thoroughly enjoying bearing witness to the amazing role of basic human instinct and to watching a new human being discover the world. I am also enjoying the challenge of rebalancing my life and reprioritizing what I need to do (NSF full proposal, here I come!) And I also look forward to sharing this new adventure – but not too much. *Probably not something I should admit – nearly as bad as admitting you like to stare at yourself in the mirror. Honestly, I don’t. ***If you haven’t heard from me, please accept my sincere apologies! For this month’s research highlights in Evolutionary Applications, I cover a few new papers that demonstrate the importance of thinking about evolution and ecology in fisheries science. “The pressure on both natural and managed fish stocks to keep pace with worldwide consumption presents a number of critical challenges, including the prevention of population collapse, management of disease, and understanding of the impact that fishing practices may have on life history traits. Addressing such challenges requires the integration of data from long term population monitoring, empirical work, theoretical analysis, and implementation of policy change. Fortunately, many fish populations have been monitored either actively or passively over long periods of time, generating some of the best datasets with which to characterize the impact of human-mediated selection on population-level change. The intensity of selection acting on fished populations has long been predicted to significantly impact upon life history traits. In a recent theoretical exploration of the consequences of commercial fishing, Lise Marty and coauthors highlight how exploitation of fish populations can lead to slower growth, early maturation, and higher investment in reproduction within stocks (Marty et al. 2015). The authors use an individual-based eco-genetic model to examine harvest-induced genetic change and show not only that fishing can influence life history trait evolution, but also that it can reduce effective population size and erode additive genetic variation. Together, they argue, these effects are likely to hinder recovery even after intense fishing has ceased. Another recent theoretical analysis examining the consequences of fisheries on stock populations suggests that common fishing policies can result in disruptive selection for maturation strategies (Landi et al. 2015). Using an eco-evolutionary model, Pietro Landi and colleagues demonstrate how the interplay between adaptation of fish stocks and adaptation of fisheries policy can lead to dimorphism within populations, with some individuals reaching maturation early and others late, investing instead in growth and fecundity. This work highlights the potentially complex outcomes of size-selective harvesting and the need for adaptive policies that take into account evolutionary change of fish populations. Harvest-mediated shifts in life history have thus far been demonstrated under a variety of scenarios. Recent empirical work examining size and weight distributions of exploited sea cucumber populations in Turkey finds evidence for the loss of larger size classes, as predicted from intensive size-dependent harvesting (González-Wangüemert et al. 2015). By comparing fishery and nonfishery populations, Mercedes González-Wangüemert and collaborators show that individuals from protected populations tend to be larger and heavier, with higher genetic diversity than those from exploited populations. Given that sea cucumber over-exploitation is a relatively recent and growing phenomenon, this work offers an important new data point in a rapidly expanding body of evidence for rapid fisheries-mediated evolutionary change in fish stocks. Finally, just like natural populations, managed fish stocks face a constant onslaught of pests and pathogens. This is further exacerbated by high population densities, increased movement of disease agents among populations, and potentially by selection for desirable traits that are negatively correlated with resistance. A recent review by Kevin Lafferty and coauthors examines the ongoing challenges associated with controlling the emergence and spread of disease within fisheries and aquaculture, highlighting a number of significant infectious agents with severe economic impacts. The authors further explore how the novel evolutionary environment of fish farms might influence pathogen evolution, for example leading to higher virulence, and whether host resistance is likely to evolve under current fishing practices (Lafferty et al. 2015). For bacterial pathogens within fish farms, there has been increasing interest in the use of bacteriophages as control agents. Although there is still uncertainty in regard to best practice for the application of phages within these complex environments, work from the laboratory suggests this as a promising avenue, especially in combination with other control measures. Recent work by Daniel Castillo and collaborators undertook a study on the common fish pathogen, Flavobacterium psychrophilum, to examine both the genetic changes underlying the evolution of bacterial resistance to phage and the physiological changes associated with such resistance (Castillo et al. 2015). They found numerous mutational changes underlying resistance, suggesting that resistance can be attained relatively easily and via a number of mechanisms, but also that these resistance mutations are often associated with a loss of virulence when measured in vitro. Castillo, D., R. H. Christiansen, I. Dalsgaard, L. Madsen, and M. Middelboe 2015. Bacteriophage resistance mechanisms in the fish pathogen Flavobacterium psychrophilum: Linking genomic mutations to changes in bacterial virulence factors. Applied and environmental microbiology 81:1157–1167. González-Wangüemert, M., S. Valente, and M. Aydin 2015. Effects of fishery protection on biometry and genetic structure of two target sea cucumber species from the Mediterranean Sea. Hydrobiologia 743:65–74. Lafferty, K. D., C. D. Harvell, J. M. Conrad, C. S. Friedman, M. L. Kent, A. M. Kuris, E. N. Powell et al. 2015. Infectious diseases affect marine fisheries and aquaculture economics. Annual review of marine science 7:471–496. Landi, P., C. Hui, and U. Dieckmann 2015. Fisheries-induced disruptive selection. Journal of theoretical biology 365:204–216. Marty, L., U. Dieckmann, and B. Ernande 2015. Fisheries-induced neutral and adaptive evolution in exploited fish populations and consequences for their adaptive potential. Evolutionary Applications 8:47–63. 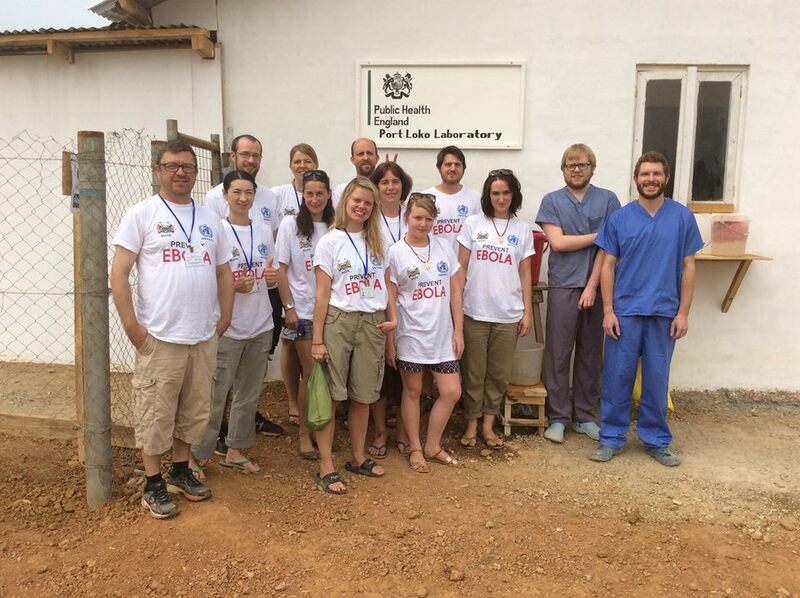 The post below is written by Sean Meaden (a PhD student in the lab working on bacteria-phage interactions in plants) about his recent experience in Sierra Leone volunteering with Public Health England at an Ebola clinic: No hand-shakes, no kisses, no contact: there’s never been a better time to be a socially awkward Brit than in the middle of an Ebola outbreak. Despite life in West Africa being far from normal right now, with deciding on the best no-touch greeting the least of it, new cases of Ebola seem to be falling. This is due in no small part to the coordinated efforts of governments, NGOs and committed healthcare workers. 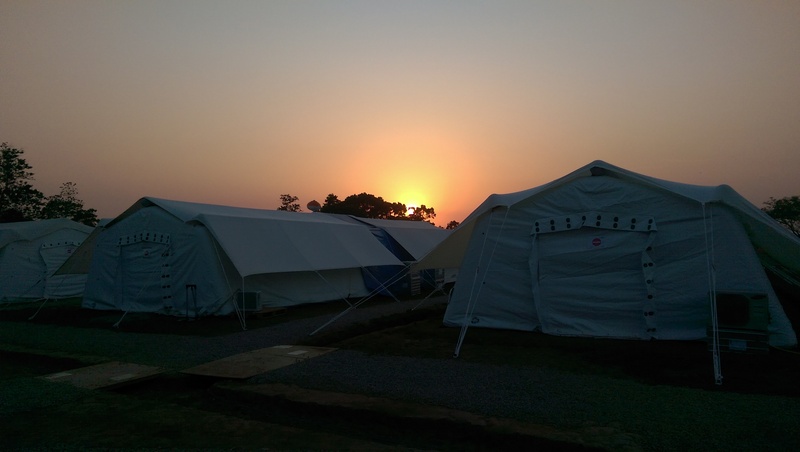 This is a post about a deployment I volunteered for to work in a diagnostic lab run by Public Health England in Port Loko, Sierra Leone. On the 20th of November I applied to travel to Sierra Leone and work in an Ebola diagnostic lab at a recently built treatment centre by the Irish charity GOAL. 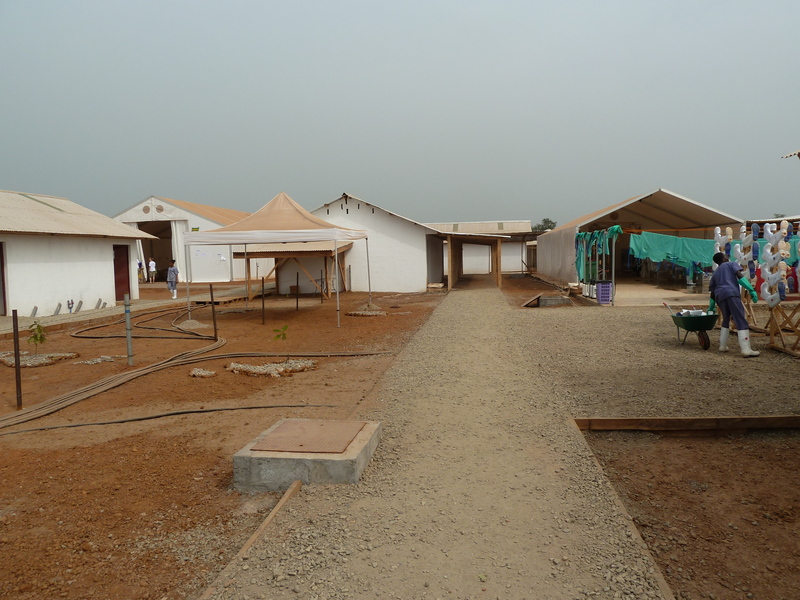 How does a 26 year old PhD student from Devon end up in a Danish-military run camp in rural West Africa? Despite my high-risk, and at times perilous research on tomato plants, I am perhaps not the most obvious choice for such work. 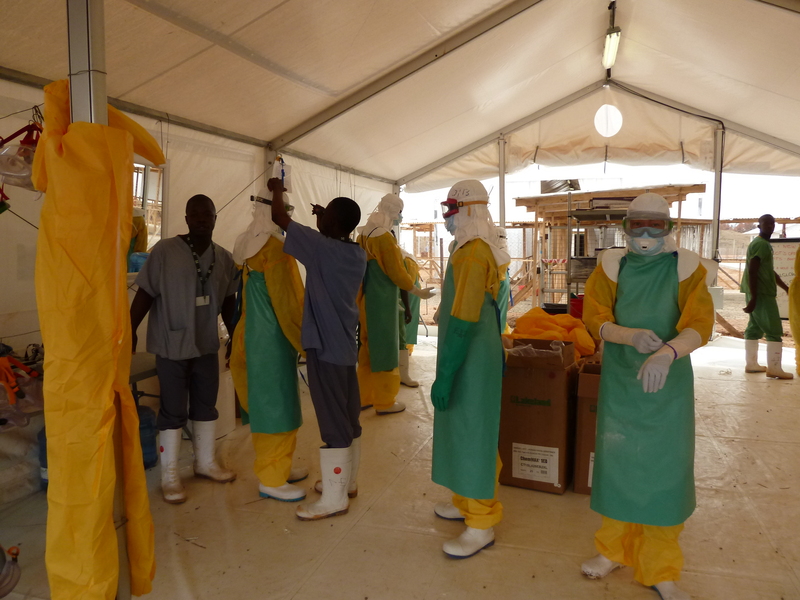 However, a week’s intensive training at Porton Down, the UK’s leading biosafety laboratory, and the support of very capable and experienced colleagues meant I was equipped to perform diagnostic tests on Ebola samples. My day job as a PhD student at the University of Exeter is researching the microbes that cause plant diseases. And whilst the setting is somewhat different, the underlying biology and genetic techniques are all very similar. The chance to take these skills, garnered from an education at UK institutions, to those less fortunate in a country with a literacy rate of 43%, seemed like a unique opportunity. The aim of DFID (Dpt. For International Development) and PHE is to contain the outbreak to the locations in which it already has a stranglehold, thus helping those countries heavily affected and preventing the disease from spreading back to the UK. In my 5 week deployment I, along with a team of 10 other scientists, performed over a thousand tests on samples from suspected cases at the treatment centre where I was based and the many more that arrived by motorcycle courier from across the region. The work itself was pretty straightforward, which is a testament to the guys at PHE who design the protocols for the tests. 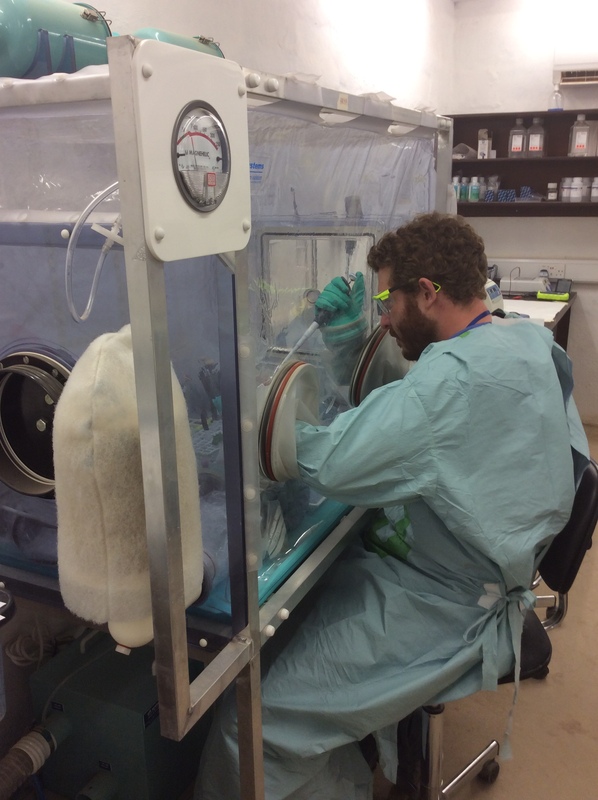 Essentially, you have to safely get the sample into an isolator, which is a big soft plastic box with gloves attached that puts an extra barrier between you and the virus. Once you’ve ‘killed’ the virus you can start working with its genes. It’s still the source of some debate in a couple of ivory towers about whether a virus is truly alive or not: call me old-fashioned but I think if it can replicate, and it’s replication can kill you, I want to call it dead when it stops working. Once it’s dead we can run tests that look for the genes of the virus in the sample, then measures the fluorescence given off by the reaction (qPCR). If it all sounds a bit tech, it is- Douglas Adams’ line “we are stuck with technology when what we really want is just stuff that works” has never been more apt. The reality is that Ebola is tricky to study and not normally a big problem, with outbreaks averaging around 200 deaths, rather than the nearly 10,000 deaths in the current West African outbreak. As such, there’s never been a huge need for a rapid test. Fortunately a new vaccine trial and rapid blood tests will change things in the wake of this outbreak and I hope our line of work will be redundant soon. To some extent our stress levels were dictated by the ebb and flow of samples arriving. On some of the quieter mornings we were fighting for menial jobs and some artistic creativity was employed decorating the lab gowns of those not present. Life in the camp was occasionally spiced up with a celebrity visit. The Danish Prime Minister Helle Thorning-Schmidt flew out for a visit, taking time to don the protective clothing worn by doctors, nurses and hygienists in treatment centres. As a huge Borgen fan I was somewhat hoping to get a selfie with the real-life Birgitte Nyborg but sadly our political romance was over before it had begun. 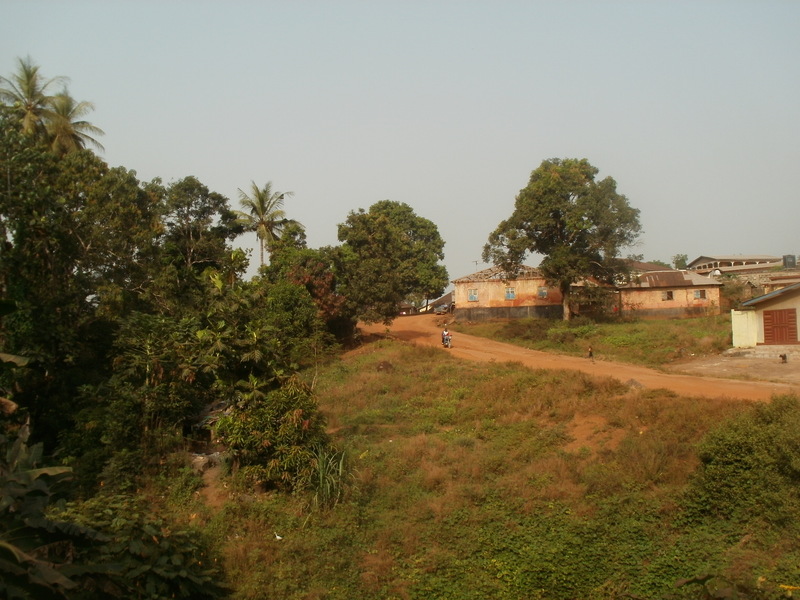 Understandably, our contact with the community was minimal but my naïve interpretation wasn’t that Port Loko was a ghost town, rather a community trying to get on with everyday life in the midst of the outbreak. The same was true when we visited a beach on a day off at the end of the deployment. A burgeoning tourist industry has been stalled as a result of the outbreak. Still, it was pretty refreshing to chat about surfing with some of the local guys- and fortunately it was flat so the temptation to surf wasn’t even an option. Finally, kudos to the doctors and nurses stationed in our camp. Wearing full PPE (the yellow protective suits required for patient contact) in 35 degree heat and 85% humidity takes some guts. So too does couriering a sample on the back of a motorbike from the community hospitals and holding centres over to the testing laboratories, or swabbing a corpse to allow effective contact tracing. In short, I met some very brave people who worked incredibly hard to treat those affected, and by the looks of the current case statistics their efforts are being rewarded. “As we highlight each month in this section, the application of evolutionary theory to issues affecting the health and well-being of human, agricultural, and natural populations is gaining increasing momentum. In a recent review article written for Science, Scott Carroll et al. take on the now monumental task of synthesizing the many ways that evolutionary biology can be used to address global challenges (Carroll et al. 2014). They comprehensively explore the main problems being tackled with an evolutionary approach, ranging from populations evolving too quickly (such as emerging pathogens or pests evolving resistance to treatment) to populations not evolving quickly enough (for example those being negatively affected by human-mediated change). The authors begin by identifying what they see as the two key paradigms of applied evolutionary biology: (i) managing contemporary evolution (i.e., manipulating the rapid evolutionary response of short-lived organisms with large population sizes, such as bacterial pathogens) and (ii) altering the phenotype–environment mismatch (i.e., responding to populations of long-lived organisms such as trees that are no longer well adapted to their local environment due to shifts in climatic conditions or changes in biotic interactions). As a great example of such a mismatch, the authors highlight the increasing rates of obesity, diabetes, and heart disease in the human populations as a result of a more sedentary lifestyle with diets rich in sugars and fat. They then identify a number of promising research avenues that either have addressed or have the potential to address current global challenges, covering a wide range of approaches including the use of genetic engineering to more appropriately match genomes to their environment, the use of ‘refuges’ in agriculture and combination treatments against pests and pathogens to hinder the evolution of resistance, and introducing nonlocal genotypes which are predicted to perform better under given environmental conditions into natural populations to increase local adaptation. The article nicely separates these conceptual approaches into strategies for slowing unwanted evolution or directly influencing fitness of pests and pathogens, strategies for reducing the mismatch between phenotype and the local environment, and strategies for increasing group performance by selecting on group-level traits. For example, the authors discuss the success of artificially selecting for group yield in agricultural plots rather than individual fitness as a means for decreasing competition among plants. Critically, the piece also emphasizes the need to take a unified approach in meeting international objectives for sustainable development and suggests a need for stricter enforcement of guidelines in order to ensure best practice is achieved despite temptation to put profit or immediate success ahead of sustainable solutions. Overall, the review acts as a unique and remarkable resource both for researchers and students who are new to the field of applied evolution and those who actively contribute to the field. “The study of changing sequence composition of DNA, RNA and proteins over time has offered some of the most fundamental insights into the evolutionary process to date. From understanding how populations and ultimately species diverge to the study of how particular selection pressures affect changes in genotype and phenotype, our knowledge of evolution would be a fraction of what it is now without the major advances made in the field of molecular evolution. Recent technological and bioinformatical improvements have continued to expand these insights, and have also offered key applications such as the ability to model and predict pathogen evolution, monitor the effective population size of threatened species, and help understand what constitutes a healthy microbiome. Two recent studies, both led by Nora Besansky and published in Science, emphasize the power and challenges of comparative genomics when working to understand the evolution of disease vectors. First, Daniel Neafsey and colleagues report the sequencing, assembly, and comparison of genomes from 16 Anopheles mosquito species (Neafsey et al. 2014). As 11 of these species are considered major disease vectors, comparison among the genomes allowed the researchers to examine underlying genes that may be associated with vectoring capacity. The results suggest that, relative to the Drosophila genus, the Anopholes’ genomes are remarkably flexible, with rapid rates of gene loss/gain, increased loss of introns, and shuffling of genes on the X chromosome. The data suggest a mechanism for the observed functional diversity across the species, especially in those traits such as chemosensory ability that are associated with adaptation to host feeding and therefore disease vectoring. However, comparison among genomes was hampered by what are most likely high levels of interspecific gene flow, or introgression, as described in a separate paper by Michael Fontaine and coauthors (Fontaine et al. 2014). Depending on which genomic segment the authors used to build phylogenetic trees, a remarkably different pattern emerged; trees based on autosomal sequences tended to group the three major vectors of malaria together, while those built using the X chromosome suggest early radiation of these three species and persistent introgression on the autosomes. Together, these studies offer tantalizing hypotheses for the adaptive significance of among-species gene flow and genomic plasticity in allowing the Anopholes genus to act as vectors for a wide array of pathogens. In addition to the increasing power of genomics and phylogenomics, the use of transcriptional profiling has also proven invaluable to the field. A recent review of novel insights gained through transcriptomic analyses of natural populations by Mariano Alvarez and collaborators highlights the utility of this approach in testing how genotype translates to phenotype, and how this translation is influenced by environment-specific gene expression (Alvarez et al. 2014). Such variation can have dramatic implications for the process of adaptation as well as our ability to predict the response of populations to rapid environmental changes such as those resulting from pathogens, pollutants, or climate change. More recent advancement in transcriptomics includes the ability to profile gene expression of single cells, as discussed by Nicola Crosetto and coauthors in a new paper reviewing recent progress in spatiotemporal transcriptomics (Crosetto et al. 2015). Among the many applications of this powerful approach to unravelling among-cell expression differences is the ability to examine heterogeneity of tumour cells to predict drug sensitivity of various cancers. The use of sequence data to infer evolutionary processes is not limited to single species. Indeed, the use of metagenomics to infer the composition of species from environmental samples has greatly enhanced our understanding of microbial diversity. In its simplest form, metagenomic analysis allows for a culture-independent characterization of microbial community composition. This type of analysis has gained much recent attention for its application in understanding the microbiomes of eukaryotic species. For example, recent work by Julia Goodrich and colleagues examined how human genetics shapes the relative abundances of various gut bacteria by comparing microbiotas across 416 pairs of twins (Goodrich et al. 2014). The authors first discovered a clear heritability for a subset of bacterial taxa, most notably those from the family Christensenellaceae, which were also correlated with low host body-mass index (BMI). The authors then went a step further by adding a particular species of Christensenellaceae into an obese-associated microbiome and inoculating sterile mice with either the unaltered or altered microbial community. In this way, they were able to demonstrate not only correlation with host metabolism in humans but also to infer causation, as mice supplemented with this species showed reduced weight gain relative to those not receiving the supplement. The simultaneous analysis of multiple genomes within a single environmental sample also allows for assessment of selection acting on genes shared by members of the community. A terrific example of this comes from recent work by Molly Gibson and collaborators who examined the so-called ‘resistome’ of microbial communities from soil and the human gut, in this case focusing on the genes conferring resistance against 18 antibiotics typically used in clinical settings (Gibson et al. 2015). The authors used a new database of protein families to assign antibiotic resistance functions to each metagenomic segment, and were able to demonstrate that the antibiotic resistance genes found in environmental versus human-associated microbiota were functionally different, perhaps suggesting less gene flow among these communities than previously thought. Overall, the recent advancements in both omics and bioinformatics have been game-changing for the field of molecular evolution, and the application of such new approaches and technologies have only begun to surface. The potential for advancement in clinical and agricultural settings is already being realized, and application to the management of natural populations, including the spread of disease, is already following.